Sunburn to host multi-city dance music show featuring World #18 W&W | WhatsTheScene? It’s party-time again for music enthusiasts as Sunburn, for the very first time brings a special conceptualized dance music show #SOA50 celebrating the 50th episode of popular online radio, Sunburn On Air. Launched in April 2014, Sunburn On Air recently crossed 1 million hits on iTunes making it the #1 dance music podcast in India. The show has featured biggest names of EDM like Afrojack, Dimitri Vegas & Like Mike, Hardwell, Martin Garrix, Paul Van Dyk, W&W and many more. For the first time, Sunburn will be executing a conceptualized dance music show with signature stage design and visuals. The event will supposedly have a perfect mix of stunning lights, stage performers and spectacular laser show at par with what we saw at IAmHardwell and ASOT600. 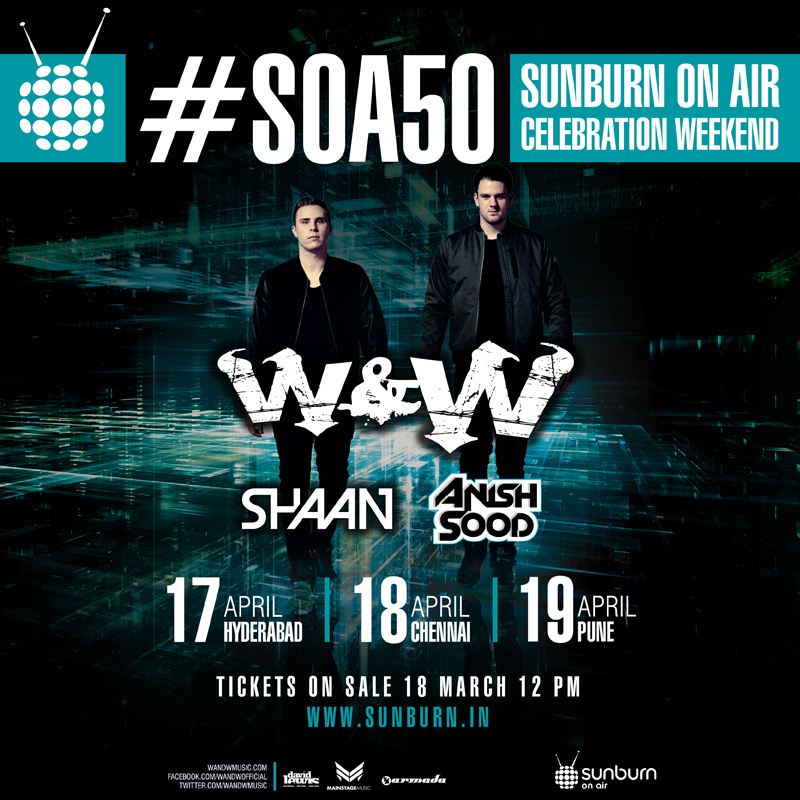 The show will be held in 3 cities including Hyderabad on 17th April, Chennai on 18th April and Pune on 19th April 2015 featuring a lineup of performances including World #18 Dutch duo W&W, Sunburn resident DJ Shaan and DJAnish Sood. Tickets go on sale on 18th March at 12 PM on sunburn.in. Limited early entry tickets will be available.